This is a report of how a local worker has used the Saber player in Laos and Vietnam. Our worker played the Saber in four places in Vietnam and five in Laos. A total of 510 people heard the gospel through the Saber in Vietnam (among them 180 attendants of the church leader training course). In Laos 250 people heard. 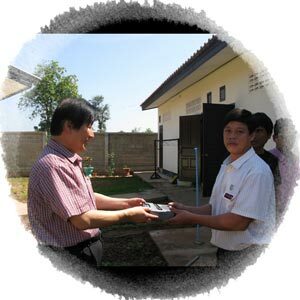 In Vietnam two people professed their belief in Christ for the first time after hearing the message, and in Laos from 130 people one family (husband and wife and two children) received Jesus and began to attend the Sunday service. The local worker played the Saber to church members in his own village and those who visit him at his home. People who live far away and who do not have transport and those who have no other way of hearing the Gospel are particularly interested in the Saber. Some heard the gospel for the first time and received Jesus as their Savior under the guidance of the local worker. Many who had heard asked to borrow the Saber but the worker was not prepared to lend it in case it got broken or lost. But whenever he travels a distance, he takes the Saber out so that people can hear the message.